Explore outdoor activities that are new to you. When you’ve earned this badge, you’ll have tried a lot of new things outdoors and learned which activities you want to do again. 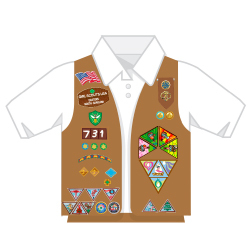 Girl Scout badges, awards and other insignia that are earned for the accomplishment of skill-building activities or any set requirements should be presented, worn or displayed only after Girl Scouts have completed the requirements outlined in the appropriate program materials. Iron-on. Imported.